Today’s post will be super quick and super focused: it’s a discussion of the absolute best productivity personal management tool out there, follow-up then. I’ve done a few posts about productivity tools and tips and I have mentioned some of the tools I use to keep me on track but today I want to go into detail on the one that is, in all honesty, the number one key to a lot of my career success. FYI, this is not an ad, I’m not being compensated in any way for this post and haven’t even had any contact with follow-up then besides using the tool, but I seriously love the service and just wanted to share with all of you. Follow-up then is an awesome email tool that lets you pull emails out of your inbox and have them come back in at a specified future time or date. I am an inbox zero gal and my whole life is organized around my email, so this is life-changing. If you’re not an inbox zero person, this likely isn’t quite as amazing, but it’s still a great tool. To begin using follow-up then, all you have to do is send an email to whenever you want your email to come back to your inbox at followupthen.com. For example, this morning I got an email reminder to renew my website hosting but it doesn’t have to be done for a month, so I don’t want to deal with it now. I do want that email out of my inbox though, so I simply forward that email to 3weeks@followupthen.com and that’s it. It will pop back into my inbox in 3 weeks and I can deal with the renewal process then. It’s amazing. I do the same if I need to remember to follow-up with someone on something I’ve asked them to do. So, for example, I might shoot an email to someone on my team asking them to create a draft one-pager for a program we offer and I need to remember to make sure it happened by Tuesday of next week. I would add tuesday@followupthen.com to the bcc of the email I send to the employee and then that email will pop back into my inbox next Tuesday morning reminding me to check on the progress. It’s as simple as that. Plus, unlike other similar services, which I have talked about before, follow-up then doesn’t have a limit on the number of reminders you can set so you don’t have to worry about exceeding any limits on the free plan and then having to pay. They’ve also been adding some awesome new features like short codes that will make a reminder pop into your inbox every day until you mark it complete. It’s honestly the best tool in my toolkit and I would really struggle to be as on top of everything as I am without it. Okay, that’s it. I told you it would be short and sweet. I just don’t want to keep kickass tools that can help other entrepreneurs to myself so I wanted to share. This one is integral enough to my workflow that I thought it deserved its own post instead of being lumped into another list of tools. 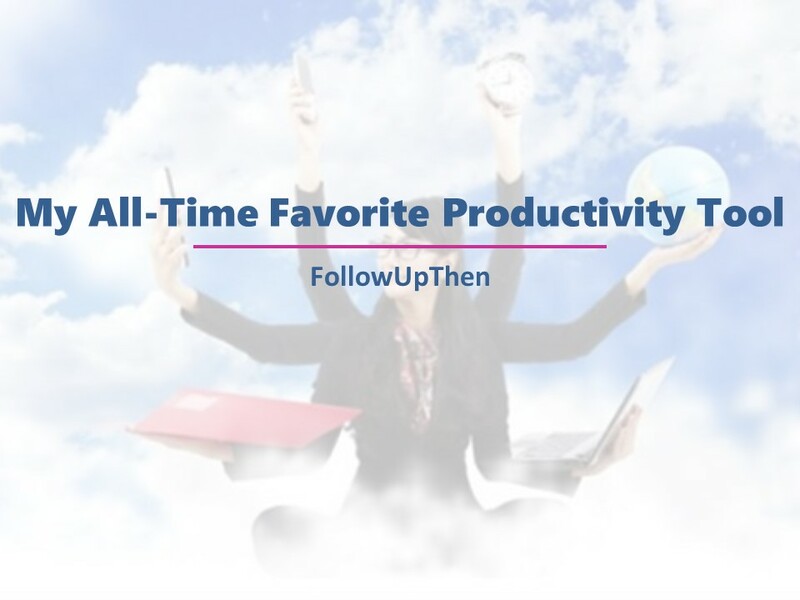 Followupthen is one of the tools I have in my productivity arsenal, a tool within a 4 step process to get more done in less time. If you could use some help accomplishing what you need to get done more quickly, grab my guide: 4 Steps to Improving Productivity. Click here to get the guide for just $1 and start getting more done faster right away. Is it followupthen.com or followup? I use followupthen.com. I used to use followup.cc but that one has a limit on the number of follow-ups per month so I recommend/prefer followupthen.com. Emails you forward don’t disappear from your inbox at all. You have to manually delete them. That’s an extra step and takes extra time. My inbox settings are such that I only see unread emails, so there is no extra step for me.